I have always been fascinated by the tall, exquisite window that looms over the first landing in the white marble staircase that leads from the ground floor to the first floor of the Director’s residence. 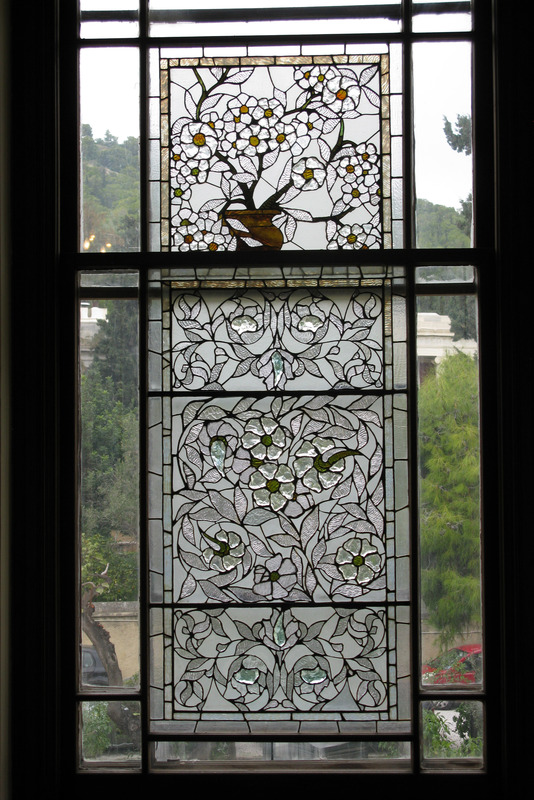 It was once rumored to be a Tiffany creation, but in Louis Lord’s History of the American School, written more than fifty years after the construction of the building, McPherson was credited as the donor–“…and from Mr. W. J. Macpherson a fine decorated window for the main staircase” (1947, p. 29). One suspects that Lord was drawing his information from the AABN article, but it puzzles me why he did not also credit the Belcher Glass Mosaic Company, since in that place the decorated glassworks of the School’s building had been attributed to both Belcher and McPherson. Before turning to a more detailed discussion of Belcher’s and McPherson’s glass creations, it will be useful to share with you a bit more about the architectural history of the Director’s residence, first built not only to house the director, but also the library and business offices of the American School, newly established in permanent quarters in Kolonaki. The first essay about the building appeared in the December 7, 1889 issue of the leading architectural publication of the period, the American Architect and Building News, under an odd title: “The American School at Athens, and Delphi.” The article, penned by Thomas Ludlow, names William R. Ware as the building’s architect and praises the design for its “most harmonious lines and proportions, and … modest simplicity of decoration fitting in the presence of the unapproachable monuments of the Acropolis.” (It is today difficult to believe that the Parthenon was actually visible from the School in 1889, since the view has been blocked for decades by more recent constructions.) Although the name of William Robert Ware is no longer recognizable to alumni of the school, he was a highly esteemed architect at the time. His reputation derived in part from his creations with partner Henry Van Brunt, but, to a larger degree, from his impact on students in the classroom, first at MIT and later at Columbia University (1881-1903). William R. Ware also played an important role in the creation of AABN in 1876 and was a regular contributor to it. It is no surprise that the American School was featured in the periodical. The ASCSA Decorated Window. Detail. After the partnership of Ware & Van Brunt was terminated in 1881, Ware departed for New York to found an instructional program in architecture at Columbia. “Once at Columbia, Ware would rarely again be involved in the active practice of architecture. His sole documented design during his Columbia years was the American School of Classical Studies in Athens, completed in 1888. Charles Eliot Norton was the leading force behind the endeavor: the connection between Ware and Norton ha[d] now come full circle” (Alexander-Shilland 1999, p. 271). Back in 1865, Norton, as the first professor of Fine Art at Harvard College, had asked Ware to design Harvard’s Memorial Hall; twenty years later Norton, as the founding spirit of the American School, would ask Ware to design the School’s building in Athens. 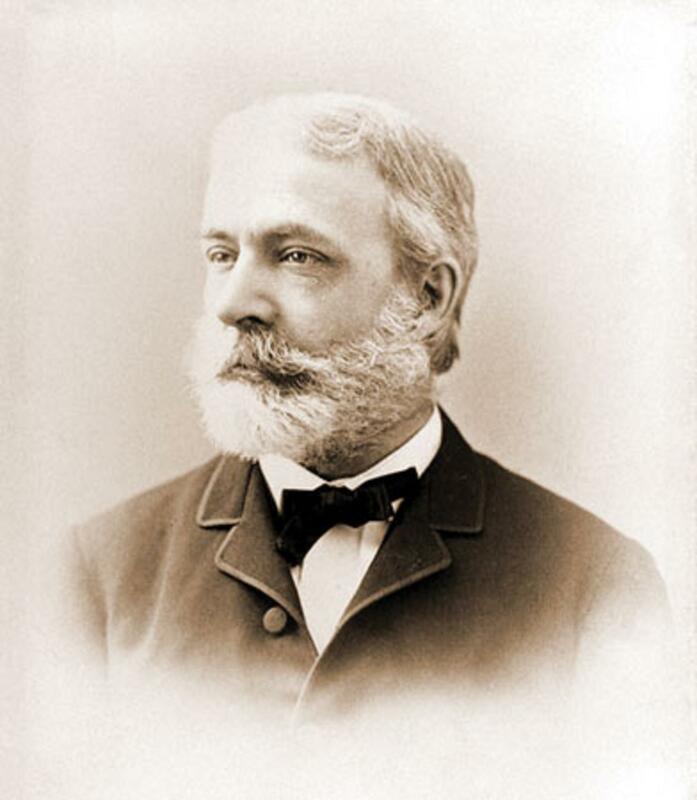 The on-site supervisor was a young architect and member of the School (1887-1889), Samuel Breck Parkman Trowbridge, who later established with Godhue Livingston a highly successful New York-based architectural firm. 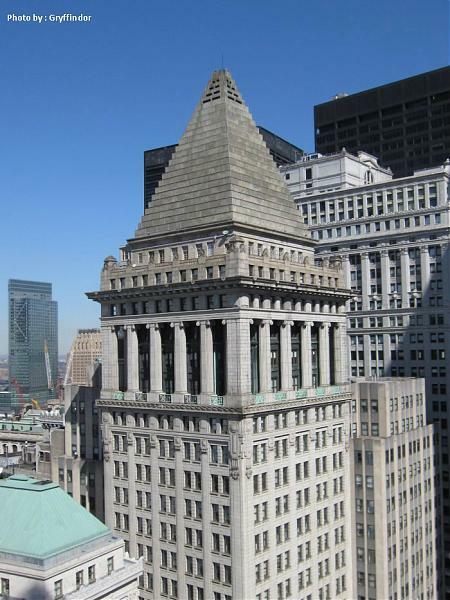 The Trowbridge and Livingston firm designed several distinguished buildings in America including the 37-story Bankers Trust Company Building at 14 Wall Street, its plan inspired by the Mausoleum of Halicarnassus and St. Mark’s Campanile in Venice. The original architectural plans for the ASCSA building are preserved in the A.D.F. Hamlin Collection in the Avery Library of Columbia University. Hamlin had served as assistant to Ware in the 1880s and later became a full professor and dean after Ware’s retirement. Some of you may remember that I wrote about Ware in the School’s Newsletter (no. 44, Spring 2000, p. 3), when I first discovered that his plans were housed at Columbia University. It was then that I came across two informative doctoral dissertations written about Ware: one by Kimberley Alexander-Shilland, “Ware and Van Brunt: Architectural Practice and Professionalization (1863-1881),” Boston University 1999; and the other by J. A. Chewing, “William Robert Ware and the Beginnings of Architectural Education in the United States,” MIT 1986. 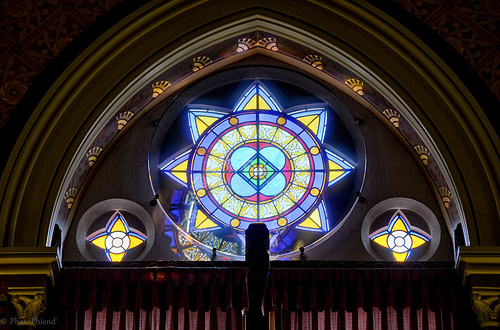 If Charles Eliot Norton and William Robert Ware closed a circle in 1886, Ware closed a second at the same time by assigning the design of the decorated window in the Director’s residence to William J. McPherson. McPherson had already manufactured several stained glass windows for Harvard’s Memorial Hall, Ware and van Brunt’s first large-scale commission. Not much is known about McPherson’s studio. He advertised himself as painter, decorator, and designer in The Decorator and Furnisher, the leading magazine for interior decorating in the late 19th century. Historical architect and stained glass expert, Lance Kasparian, whom I wrote for advice concerning McPherson, describes him as the head of “a large painting and decorating firm” and as “an expert in his field who capitalized on new design talent and cutting edge style.” McPherson, who set up his studio in Boston in the 1840s, had a short collaboration with Scottish designer Donald McDonald (1841-1916) in the 1870s, as well as with another gifted and highly innovative designer, John La Farge (1835-1910). The latter is credited with the discovery and use of opalescent glass in stained glass windows. From reading William Patriquin and Julie Sloan’s book on The Berkshire Glass Works (2011), I gathered that one of McPherson’s largest commissions was the glazing program of the State Capitol in Hartford, Connecticut (1878). According to Kasparian, McPherson is the credited creator of the stained glass monuments of Packer Chapel, and perhaps also of the Linderman Rotunda, at Lehigh University . 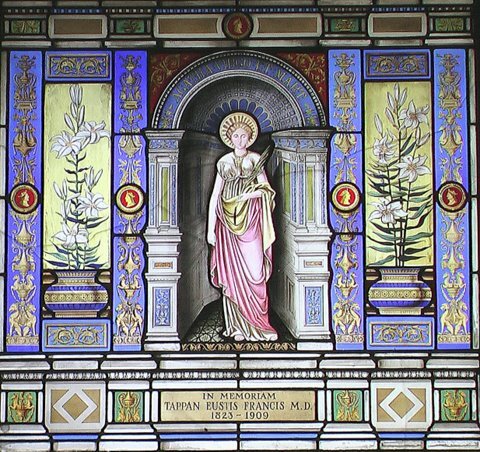 A little later, around 1880, McPherson created the Francis Window depicting St. Agatha for Dr. Tappan G. Francis’s house in Brookline, Mass. This window was donated to the First Parish in Brookline by Francis’ sons after their father’s death. Furthermore, on the web page of the Evergreen Museum and Library at Johns Hopkins University I read that its North Entrance was designed by New York architect Lawrence Aspinwall in 1896. The glass and wrought iron canopy over the door was created by Louis Comfort Tiffany, while Aspinwall employed W. J. McPherson &Co. to design the stained glass windows that illuminate the staircase. (Jacquelyn Clemens, a member of the School, a graduate student at Johns Hopkins University, and an aspiring photographer, will try to photograph it for me). In the absence of a study dedicated to McPherson’s studio and the history of his style, it is hard to contextualize the American School’s window. Most of McPherson’s creations (that I found) are located in churches and public buildings, and consequently their themes are of a religious or public character. His residential glass works are harder to characterize either because the houses no longer exist or the owners have not publicized their windows. Moreover, residential stained glass windows are a highly-marketable commodity. Once removed from a house they are easily sold at auctions and eventually lose their identity. The only other residential stained glass window by McPherson that I was able to trace is illustrated by a drawing published in The Decorator and Furnisher, May 1886; except for its floral theme, it does not bear much resemblance to the School’s window. The grayscale of the drawing also does not allow for chromatic comparisons between it and the School’s window. With the help of Barbara Krueger, an arts and crafts expert and previously a co-director of the Michigan Stained Glass Census, I was able to “read” our window carefully and to observe several details. The window is a long rectangle divided into four panels. The lower three form one thematic unit with six-petaled blossoms intertwined with leaves. 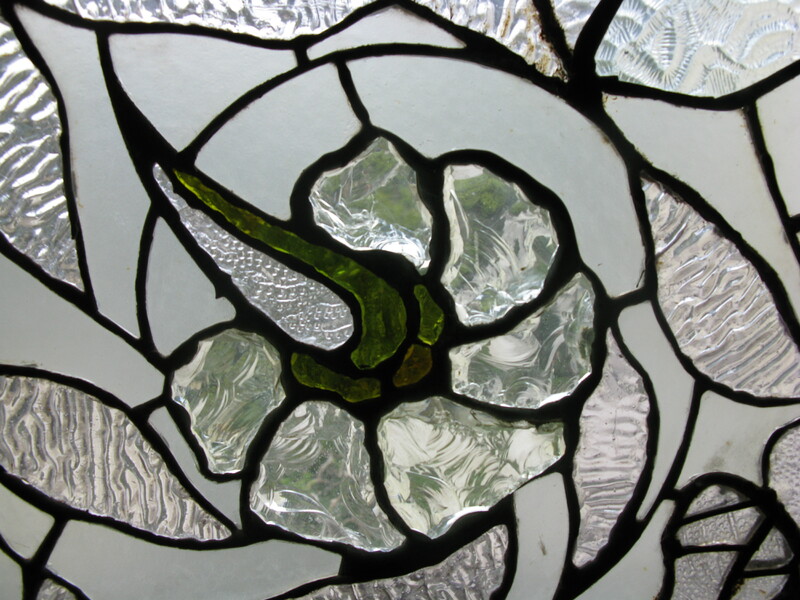 Thick, chipped glass has been used to represent the petals and the pistils of most of the blossoms. The material resembles faceted glass, but “as faceted glass wasn’t really around at this time (1888 more or less) who was producing glass sufficiently thick to chip?,” Barbara wondered in one of her recent e-mails. The top panel differs from the lower panels: the color palette is not the same and the blossoms of the tree that rises from a brown pot are smaller. From the little that is known about McPherson’s studio, one gets the impression that it was keen on experimentation. According to Kasparian, who has studied McPherson’s studio in regard to Donald McDonald’s partnership with him in the 1870s, the former continued to form collaborations with other artists after McDonald left the studio, “cultivating emerging talent and new developments” (pers. comm.). Here could enter the Belcher Mosaic Glass Co.! In the AABN article Belcher is thanked for providing the decorative panels of the outer door, but where are they? The door seems to be original to the house and its only decorative panels are the wooden relief rosettes that adorn it still. 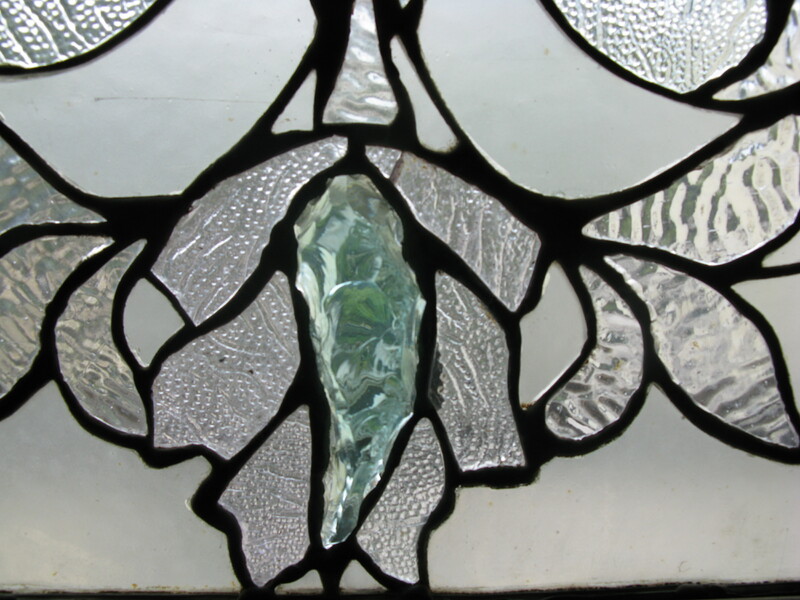 Furthermore, there is no evidence that Henry Belcher’s studio was involved with anything else but glass in the 1880s. McPherson’s studio, on the other hand, was undertaking other kind of commissions, such as the design and execution of an intricate marquetry wooden floor for the Vice President’s Office in the Eisenhower Executive Office Building, next to the White House. I wonder if McPherson is responsible for the door’s decorative elements, as well as for the design of the window, in part, the latter as a collaboration with Belcher’s studio. 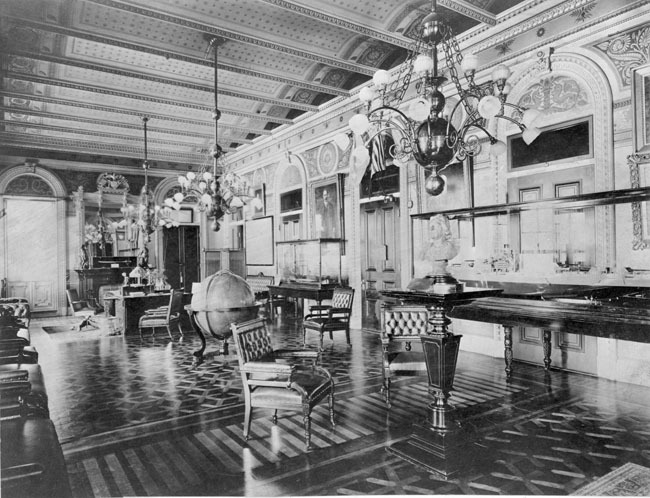 One of Belcher’s creations featured in the 1886 catalog. Notice the “mosaic” look. Belcher’s studio itself constitutes an interesting chapter in the history of American stained glass. From 1884 to 1889 Henry F. Belcher applied for four patents for “Mosaic of Glass and Lead Glazing.” His complicated but impressive technique can be described in a nutshell: he used very small, triangular glass pieces, not larger than one-half inch across; for the assembly he would sandwich the pieces between two sheets of heavy plate glass and then pour in a liquid metal alloy to bind them. 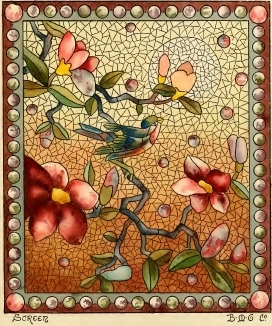 In 1886, the Belcher Mosaic Glass Company issued a beautiful catalog describing their philosophy and technique, together with a few samples of their work. Belcher’s decorated windows indeed look like mosaics. Barbara Krueger published one from a private residence in Michigan in 2005 (http://www.michiganstainedglass.org/month/month.php?month=07&year=2005). The window of the American School does not look like a typical Belcher creation but the “unusual metallic joining matrix,” the chipped plate glass, the “subtle range of colorless tints and textures,” may point to a previously undocumented and experimental collaboration between Henry Belcher and W.J. McPherson, “with McPherson orchestrating the gift and Belcher executing it” as Lance Kasparian has speculated (pers. comm.). The next time you are invited to the ASCSA Director’s residence for a welcome party or a formal dinner, please take a moment to marvel at the beautiful window by the marble staircase. And when you finish looking at it, don’t forget to admire Paul Manship’s bronze Actaeon below, another objet d’ art closely linked to the American School’s institutional history (for Gardner’s portrait by Anders Zorn, see my post of July 2013). I will be writing about Actaeon soon. I have three windows by McPherson that we removed from a Newport, R.I. residence in 1974. One is of Shakespeare and another of Milton. The largest (29″ x 58″) is of a dragoon or cavalier. If interested, I have photos. I have a W.J. McPherson stained glass im interested in selling. Do you know anyone who appraises or deals in them?